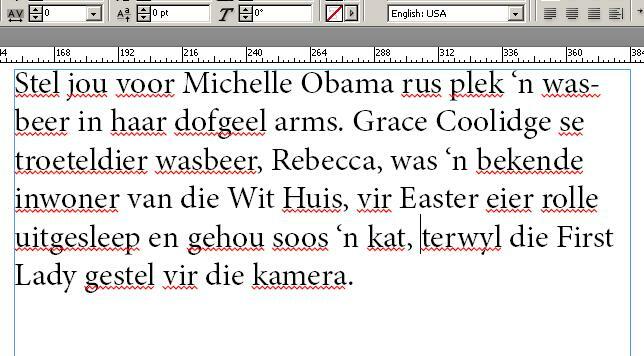 As I recently learned while helping a South African Maths text book publisher, if you want to spell-check and hyphenate text in Adobe InDesign CS6, in say, Afrikaans, you will need to add a few new dictionaries to your InDesign installation. Many of these dictionaries are free. The process is quickly documented in Adobe help, but there are a few stumbling points - especially on the Mac -- so I thought I would go through it here in a bit more detail. We'll go through the all the steps of installing a new dictionary and then testing it on the Macintosh and Windows. The process described here is for adding new dictionaries. 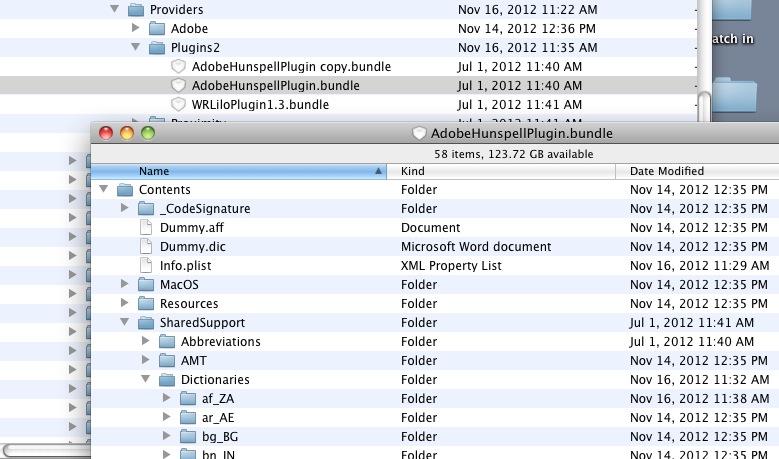 Adobe recommends you leave your existing dictionaries alone. We will be adding a new dictionary for the South African language - Afrikaans. CopyFlow Gold for InDesign CS6 has a great new tool for setting the InDesign language settings quickly and easily even in layered multilingual documents -- there's a link to more information about CopyFlow Gold at the end of this article. Dictionaries for many languages can be found for free online. Search for 'Hunspell dictionaries'. Two of the popular sites are Open Office and the Mozilla Firefox site. 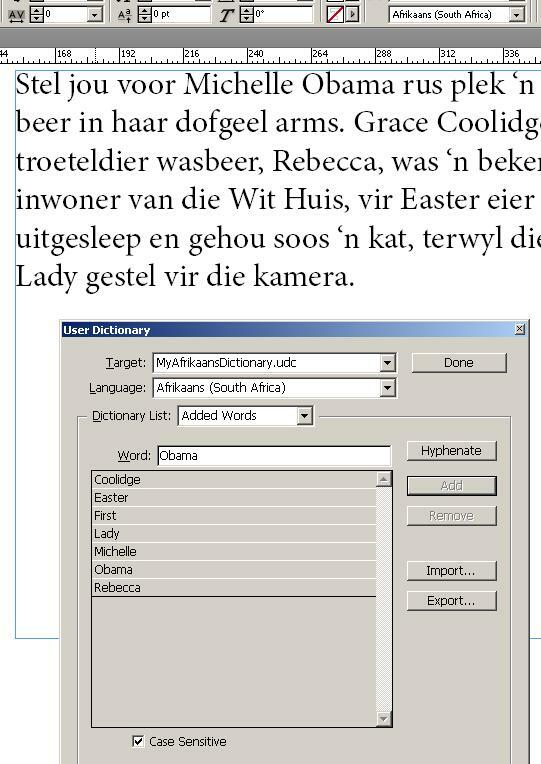 Our Afrikaans dictionary came from the Open Office site. I also downloaded a Macedonian spelling dictionary from Firefox. It came down with a .xpi extension which I renamed to be .zip to access the dictionary. Try the same approach of you download a .oxt file - rename it to be a .zip. Out of all of this, we will need only 3 files: 'af_ZA.dic' and 'af_ZA.aff' which together make up the spelling dictionary and the 'hyph_af_ZA.dic' which is the hyphenation dictionary. We'll also show how to add a Afrikaans User Dictionary at the end of this article - for all the special terms or proper names you don't want showing up as spelling mistakes. The notation for the language and the country codes, 'af-ZA', is familiar to translators-- in this case 'af' for Afrikaans and 'ZA' for South Africa. Links to more information about language and country codes can be found at the end of this article among 'Other Resources'. The details vary by platform - so we'll do each separately below. First make a backup copy of 'info.plist' somewhere safe -- in case something goes wrong. Here is the file after we have made the first edit. Then repeat this same edit in two other locations further down the file - to add the new language entry to the other lists of language and country codes for hyphenation (if we have a hyphenation dictionary) and user dictionaries. Once you are done close and save the file. After you have made these edits - restart InDesign and select some document text with the text tool. You should now see the language you have added as a valid choice in the language pop-up. Then back it up - somewhere safe. We will be editing its contents. Once that is done, Control-click (aka right click) on the file name: 'AdobeHunspellPlugin.bundle' and select the menu item: Show Package Contents. Then we can step down in this window to the Dictionaries folder. Copy dictionary files into the newly created new folder, 'af_ZA' with a Finder copy & paste. You'll need a good text editor to edit this file. 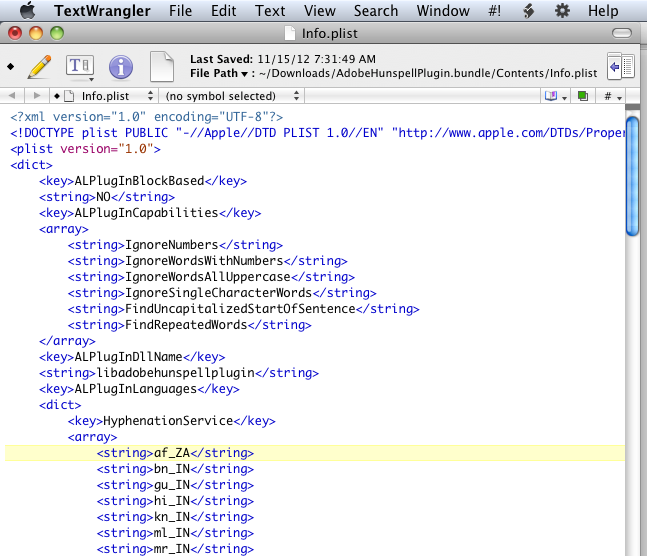 I used the free TextWrangler from BareBones. 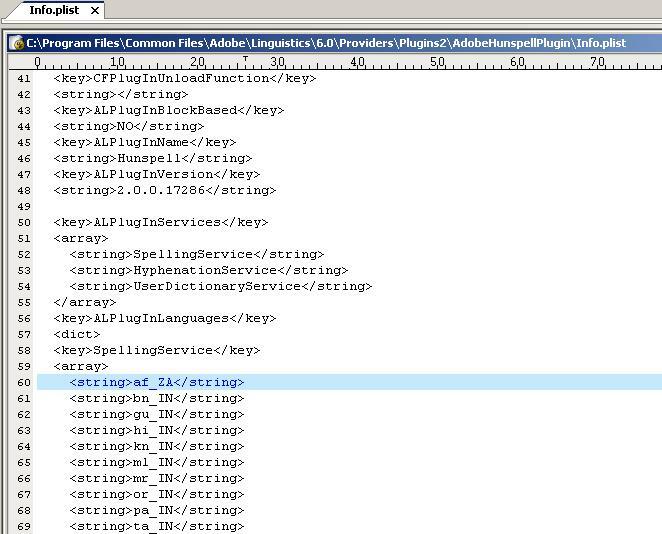 Then repeat this same edit in two other locations further down the file - to add the new language entry to the other lists of language and country codes for spelling and a user dictionaries. Once you are done close and save the file. Then close the bundle. Now only the proper names and untranslated English phrases like 'First Lady' remain. To fix these, we need to add a User Dictionary. Use the little icon below the list of dictionaries to make a new user dictionary file and specify where you would like to store it. Give it a unique name, not User Dictionary! Add your word list to your new user dictionary by going to InDesign's menu Edit-> Spelling -> User Dictionary... , then selecting your language and the new dictionary we created above. Click Import to read the file in. You can also add words interactively. For this example, we needed the Case Sensitive box checked. 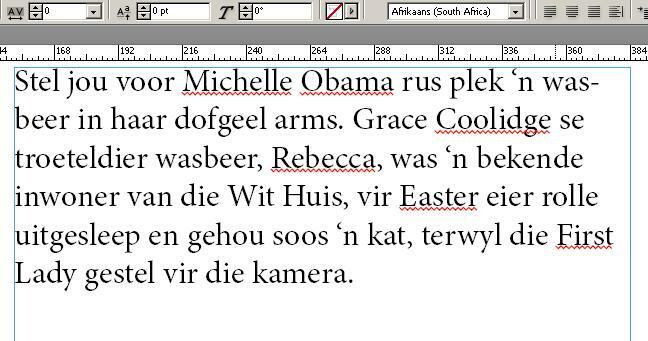 Now we have a clean spell check in Afrikaans.